Whether you are an an aerialist, acroyogi, yogi or any fitness enthusiast, you may have been curious about how one balances on their hands. I am delighted to assist a good friend and extraordinary teacher Megan Strawn as she makes the trip from Seattle, WA to share with us her pearls to balancing on our hands. Open levels workshop. We will cater to your level of current practice. Megan found circus 8 years ago after spending too much time sitting at a desk. Desperate for a hobby that would give her the opportunity to exercise her body as much as she was exercising her brain she accidentally found SANCA, the largest circus school in the country, signed up for an acrobatics class, and never left. She was thrilled to learn that she didn’t have to run away to join the circus, there was one in her own backyard. After a few years of circus acrobatics she was introduced to L-basing acro material and not long after that was collaborating with Lux on some truly fun spinny sequences. 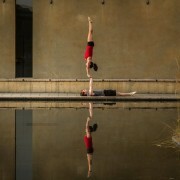 She loves the communication and collaboration of partner acrobatics, and can usually be found doing a handstand either on the floor or on another person. Acro is better with friends. Beyond base/flyer/spotter, why not add interesting flare with adding an extra player to the mix? We welcome beginners and intermediate acroyogis to this fun unique flow we put together for you. Come prepared to laugh, sweat, play and explore! This is our first of many collaborative workshops for Upstate NY friends. 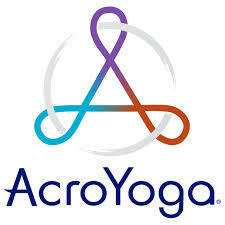 Stay warm this winter with some Acro learning! Learn to live your yoga on and off the mat so that it serves to improve total health and wellness. Dr, Joanne Wu, Rehabilitation MD, Holistic Health Coach and Registered Yoga Teacher, has the knowledge, passion and experience to guide you in this transformative 6-week journey of personal growth and wellness. 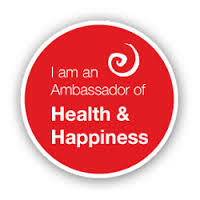 Clean up your life, your diet, your stress through a combination of small group experiences, yoga classes, telemedicine, fitbit technology and one-on-one coaching. Program cost is $250 before 12/27, $295 after. For an additional charge of $100, you can enjoy unlimited yoga for the 6 weeks of the program to help enhance this immersion experience. 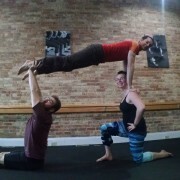 Friday Night Flights Acro Workshop series: Wash, Pop, Spin, and Power Play! Workshop 1 was a blast…numero 2 was even better…the 3rd one was flipping fun…now the pan-ultimate 4th one to wrap it up! Practicing Acro for at least 4mo and want to take it to the next level? Dissect, Refine,Align to Fly in four workshop series. Come to one, or come to all. By the end we promise you will soar with your practice with safety, fun and creativity in mind. Dates of workshops are 10/30, 11/13, 12/4, 1/8. All from 6-8pm. Pops give dynamic energy to a moving system. They are fun but can be tricky. Learn how to play with pops safely in your practice. figure out how to integrate them into a flow with grace and power! Spins are dizzying but so much fun! We will break down some foundational spins that will have you twirling, smiling and wanting more. Flow. Dance, Stand, and build power with combining different disciplines to create a solid practice that flows from the ground up. 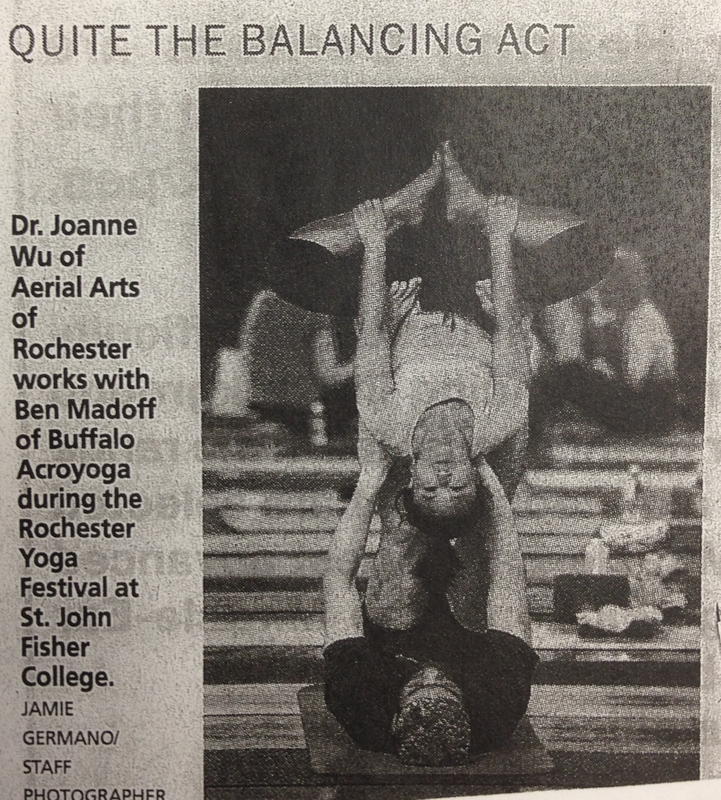 Join Acroyoga Jambassadors and SeattleAcro trained Acro Teachers Joanne Wu and Ben Madoff for this awesome good time. This workshop is meant for skill building and for those who want to think about circus acro performance. We will focus on conditioning along with new skills. Not sure if you are ready? 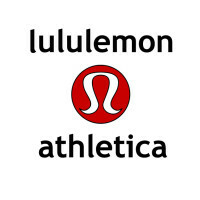 Come to my Weds AcroFit open level beginner class Weds at 5:45pm and stay for jam after. We can connect to see if you may be able to train and attend. http://fit2bwell.com/site/wp-content/uploads/2016/01/Friday-Night-Flights.jpg 1152 2048 JoanneWu http://fit2bwell.com/site/wp-content/uploads/2013/09/logo_216.png JoanneWu2016-01-01 18:20:462016-01-12 18:46:24Friday Night Flights Acro Workshop series: Wash, Pop, Spin, and Power Play!